Illegal dumping is quickly becoming a global problem. Cleaning up unsightly, hazardous garbage sites are mandatory, because they can easily pose a number of health risks, cause environmental damage, and contribute to urban blight. Used automobile tires that have been discarded to the side of a road, or in a rural area, can harbor mosquitoes when they contain stagnant water. Dump site mosquitoes can then transfer diseases such as West Nile Virus and the Zika Virus. Batteries and other electronics that have been disposed of unlawfully are easily combustible, igniting fires that cause air pollution and contamination of nearby ground water. But what about the costs? Unfortunately, for many heavily-populated municipalities, cleaning up illegal dump sites is no affordable task. Thousands of dollars are spent on clean-up crews and the equipment needed to haul the waste away. HAZMAT crews are brought in to assess any environmental concerns, as well as possible site contamination. Without a proper means of deterrence, as soon as one dump site is cleaned, another one quickly springs up in its place. While the costs incurred because of illegal dumping varies from city to city, the means is almost always the same. For example, the average cost per year associated with cleaning up illegal dumping in San Francisco is 10 million., and according to Baltimore Public Works their cost in 2017 was $21,164,771.00. These figures are the norm for large cities who are struggling to combat the problem of illegal dumping. With so much money being poured into cleaning illegal dump sites, these budgets would be better allocated to other areas of spending. If illegal dump sites were deterred and eradicated, the funds could be transferred to better use such as public transportation and community beautifying. 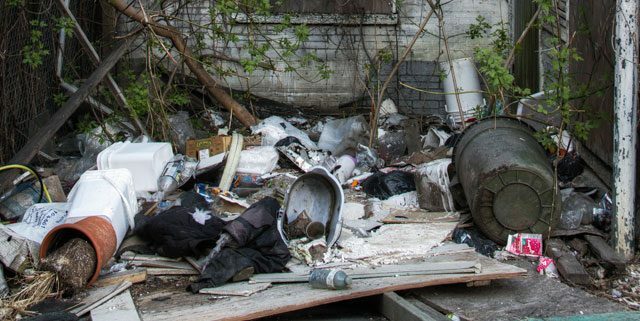 What is your city doing to stop illegal dumping?